Enveloped by the immediate darkness, I began to ascend into the unknown of Carsten Höller’s ‘Decision’, a sensory installation at Hayward Gallery in London’s Southbank Centre. 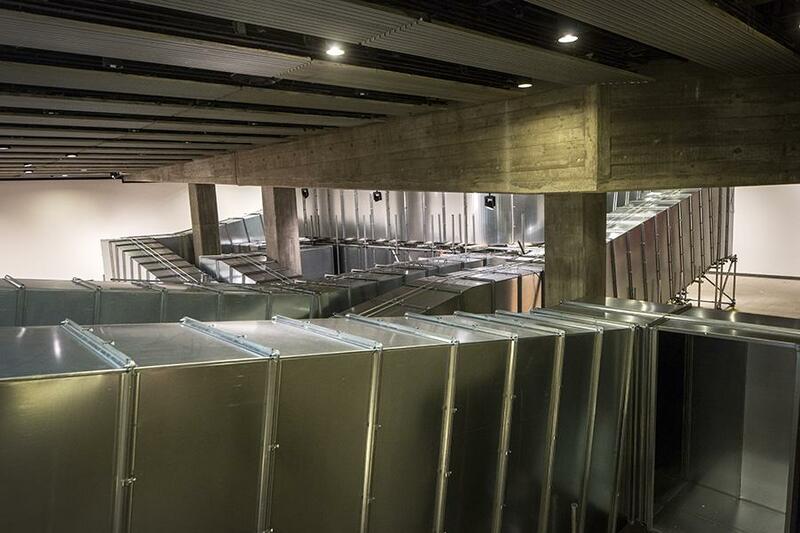 Each visitor to the exhibition is given the immediate choice of two entrances to enter the Hayward, allowing the viewer to become in control of their own experience. With no going back I move forward, twisting and turning amongst the metal casing of the ‘Decision Corridors’, giving me the impression that we are the guinea pigs of a greater experiment. But with no further instruction other than to keep walking forward, you pray for the first glimpse of light to indicate escape of the darkened maze. ‘Decision’ is Höller’s first ever retrospective in the UK with the artist taking over the entire Hayward building, allowing viewers to participate in a range of situations that become experimental, and that alter our experience of the gallery dependent on the choices we make. From entering the exhibition space we, as viewers, become in control of what we see, and the order in which we observe it. The entrance maze becomes a transitional period from any outside influences of the exhibition, allowing the white cube of the gallery space to develop into a hallucinogenic experience for all. 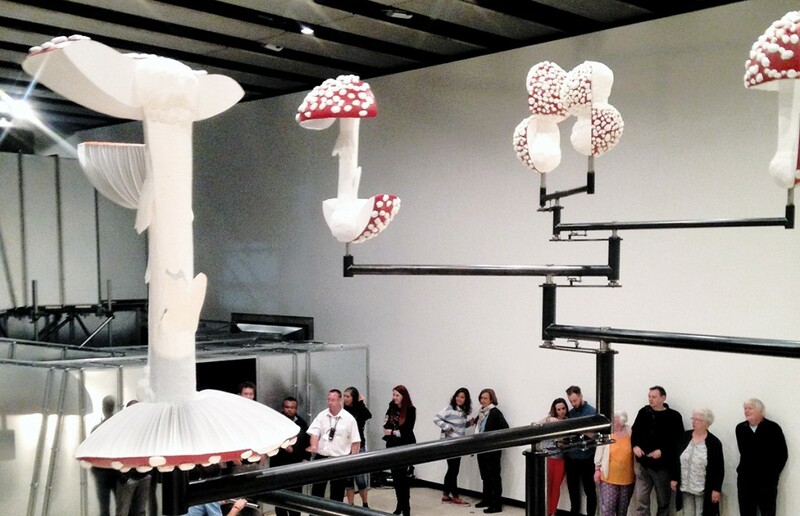 We encounter the first installation piece instantly from leaving the entrance tunnels, as gigantic red and white Mushrooms swirl and dance above our heads, controlled by other viewers of the exhibition. The scene appears to be interpreted directly from literature, but more noticeably from Alice’s Adventures in Wonderland. It was here that I knew the exhibition would begin to question my preconceived ideas of the gallery experience. As to interact with the self- mechanised airmobile would begin to question if I, myself, would influence other peoples experiences of this event. And it was this idea that I began to nourish, as the exhibition became a joint experience with the people around me. 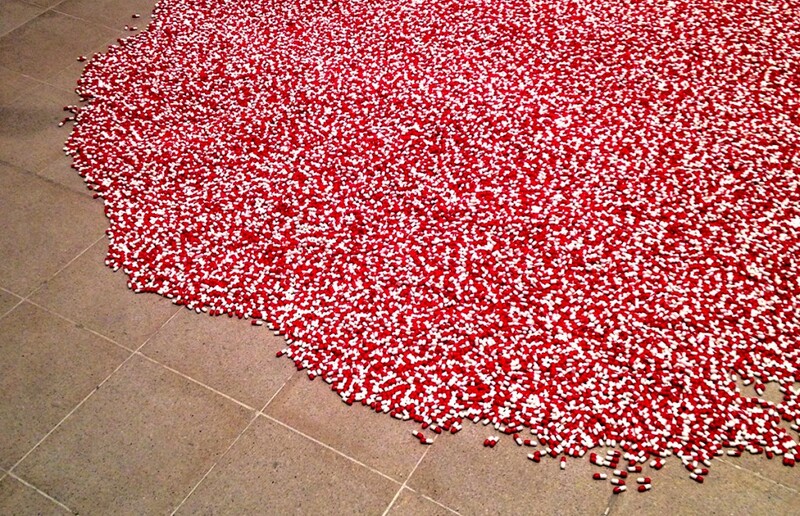 As I moved along the space of the exhibition, I was next to encounter a mound of red and white pills clustered on the floor. No perimeters or barriers blocking my approach to the objects. Instead the sea of colour was surrounded by a group of viewers, each looking at each other for encouragement in what they should do next. Upon observation, I realised that one pill would be dropped from the ceiling every three seconds to the floor, a rhythmic clock that shows the progression of time for both our observation, and also the time passed from the very first pill dropping. I began to question if I should pick up one of the many pills, but which one? Should I swallow the captivating capsule with no clue as what the contents may be? Or should I stand and observe the hypnotic collection of red and white pills, for somebody else to make the first move? Here, I felt great reluctance on whether the pill should be touched, due to our instincts of refraining to interact with the objects on display in a Gallery. Upon making the choice of entering through the next set of passages, I was lead by steps into the darkness of a room; the impression of a space that was lost and forgotten without light. Except for two solitary hospital beds moving slowly around the unoccupied space. For me they create a sense of fear, to see the impression that someone lay here, and now they are empty worries me. 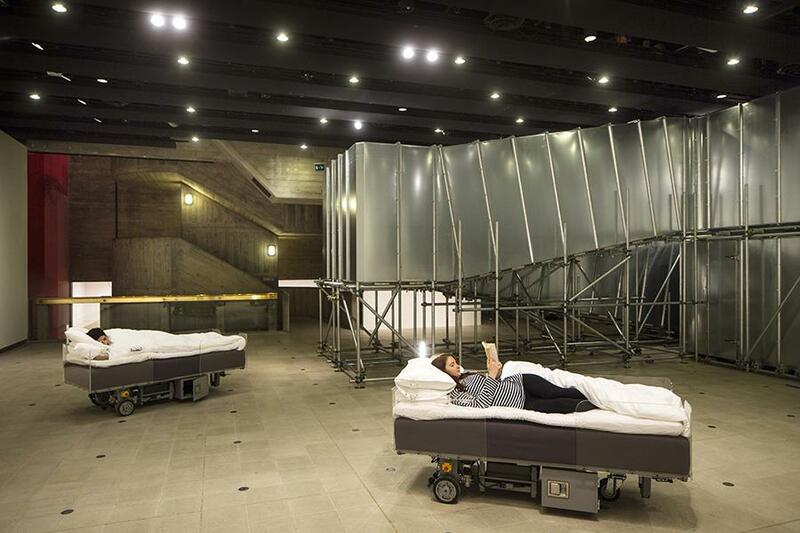 I discovered that Höller has enabled spectators to book a night in one of the beds, from which they are transported around the gallery space whilst they sleep to induce dreams. The Artist has had a great interest in exploring the notion of dreams, and the throughout the exhibition, the ‘white cube’ as theorised by Brian O’ Doherty becomes more of a collection of visions one would usually encounter during the unconscious state of sleep. Höller enables the gallery to become a discovery of the senses, and to give the viewer the option of exploring the space they are immersed in at their own leisure. From making the choice to watch the mysterious 3D film of walking through woodlands, to experiencing the world upside down; each element of the exhibition becomes a shared experience to induce our own recollections and dreamscapes. In the upper gallery, the spectators become subject to observation from all directions by the mirrored walls that line the room, vulnerable to surveillance from all angles. 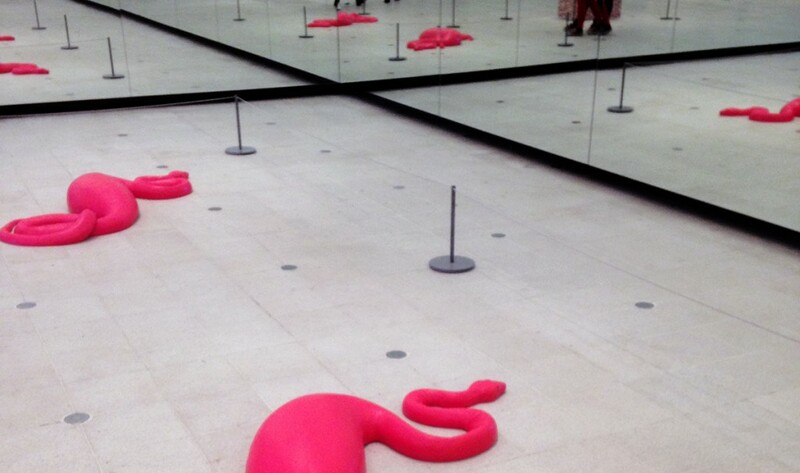 Two snakes with protruding stomachs watch from one corner as you enter the space. Are we becoming the observed subjects of a greater social experiment, or are we observing ourselves? I found it difficult to not refer to any instructions whilst manoeuvring around the Hayward Gallery, but to rather use my own instinct as a guide around the space. And to head further into the exhibition space came out of my own curiosity, as within reach came the pinnacle of the whole exhibition. Reminiscent of the twin doors in which we entered the Gallery, it only felt fitting to leave through the same method by deciding which staircase I wanted to use to head towards the roof in a surprise exit. 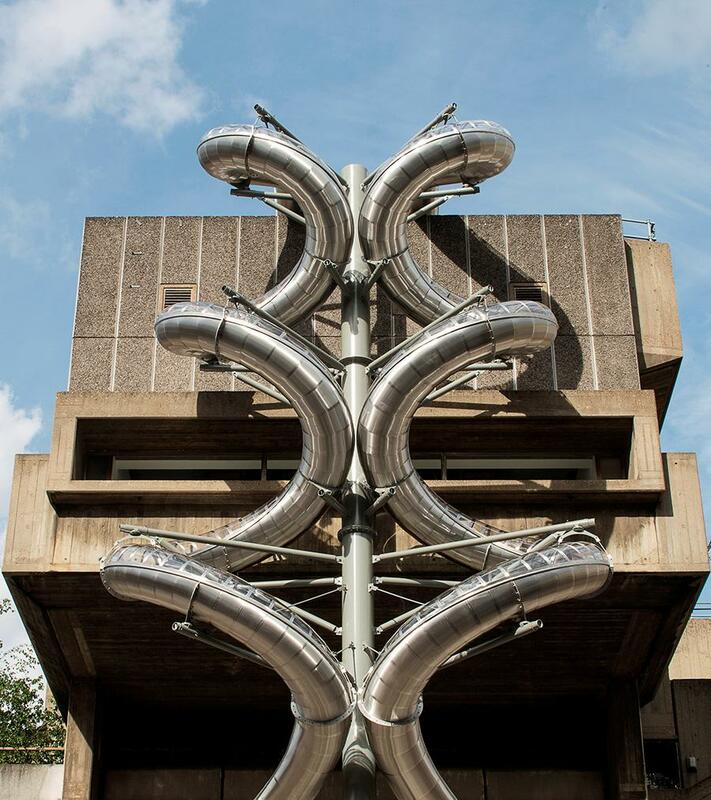 Höller had installed two identical slides that take you on a descent down the exterior of the building, akin to his 2006 ‘Test Site’ exhibition at the Tate Modern. The exhilarating pinnacle to this major exhibition of Carsten Höller made me feel young again, but should I question if this is art? I feel Höller provides us with an experience that could not be sustained in our daily routines. And to successfully entice the public to touch the artwork, to move or interact with a piece of art challenges our preconceptions and inhibitions of visiting the space itself. Höller allows the viewer to think independently once again, and to freely enjoy an experience that was reminiscent of our childhood dreams.